Truly a region of stirring drama - whether it’s in the spectacular island sunsets, a memorable wildlife encounter or enthralling tales from a history rich in conflict and passion. A landscape of contrasts. Highland, lowland, Island, mainland… as diverse as the characters which sprang from it. Iona, with its beautiful white sandy beaches. A serene and spiritual place, its Abbey was founded by St Columba in 563AD. Craggy mountains and mist shrouded lochs typify the Trossachs, the former haunt of the notorious outlaw Rob Roy MacGregor. The historic city of Stirling, and its close association with Scottish national heroes William Wallace and King Robert the Bruce. Your holiday experiences can be equally diverse. Sail from the picturesque port of Oban to romantic Hebridean isles like Mull, the largest of the Argyll islands. See its capital, the colourful harbour town of Tobermory, known by children across the world as BBC TV’s ‘Balamory’. Be amazed by the outstanding wildlife on the Isle of Islay, as well as the thought of visiting its eight working whisky distilleries. Take the high road to Scotland’s first national park - Loch Lomond and the Trossachs. It’s a living, working area supporting many small communities and a major attraction for visitors. At its heart is magnificent Loch Lomond, the largest expanse of freshwater in Britain. Poets, painters and singers have all been inspired to capture the beauty and wild romance of the loch. Charming villages like Luss and Tarbert line its shores and a multitude of water based activities are on offer. The Park’s other natural resources also make for great leisure opportunities. Climb famous Ben Lomond or choose from nearly forty other rugged peaks. You could just relax at your own pace in the tranquillity of the Queen Elizabeth Forest Park in the Trossachs. See if you can recognise the Highland Boundary Fault, which separates the Highlands from the Lowlands, and runs right through the Park. 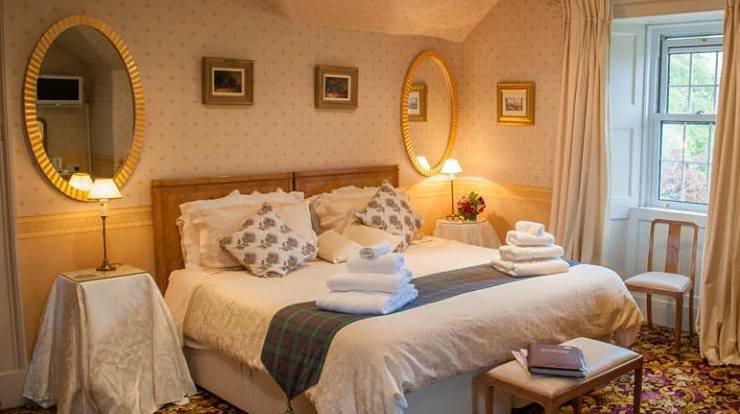 Delve into the rich heritage of the region by visiting the popular town of Callander. Here you’ll find Rob Roy’s fascinating story and be able to visit his grave at Balquidder. Board the historic steamship ‘Sir Walter Scott’ for a fantastic trip on Loch Katrine, the inspiration for his ‘Lady of the Lake’. Don’t miss elegant Hill House in Helensburgh, Charles Rennie Mackintosh’s finest domestic masterpiece and discover evidence of Scotland’s Roman history along the Antonine Wall. Stirling Castle is probably Scotland’s grandest, standing on its rocky crag high above the city. Occupying a position of vital strategic importance the city and castle featured prominently in Scotland’s medieval wars of independence. From its walls can be seen the battlefield at Bannockburn, site of Robert the Bruce’s decisive victory over an English army in 1314. Stirling is also home to the National Wallace Monument, dedicated to the memory of William Wallace, whose story was told in the movie ‘Braveheart’. From the top of the Monument, one has magnificent views of the surrounding countryuside and the Ochil Hills. Modern Stirling is a cosmopolitan university city with a wide ranging cultural life. It also makes an ideal base for exploring the surrounding countryside. Some of Scotland’s best quality produce is to be found served in the region’s restaurants, hostelries and at local food festivals. Whether it’s fine west coast seafood or tender farmed venison, lamb and beef, your appetite is sure to be satisfied. Equally fine whiskies are available from renowned distilleries throughout the area.